Embodying Idaho’s commerce and community in one convenient location. Idaho’s landscape boasts a widely varied landscape, from our expansive wooded forests to the endless deserts and savannahs. Idaho is unique in its ability to encompass mile high mountains and vast farmlands. With so much nature present, it’s hard to find the root of it all, but without a doubt, much of our rich history stems from agriculture. Farmlands surround the Boise area; we are encircled by locally grown, healthy food that provides both sustainability and sustenance for Idaho’s beautiful inhabitants. Despite the rapid metropolitan growth of Boise and surrounding areas, Idaho has remained true to nature and the importance of agriculture. A large community of farmers and consumers started the Boise Farmer’s Market three years ago. Many of these people have been working side by side for well over a decade at the Capitol City Market, but decided that the lot on 10th and Grove would be perfect for the all-inclusive Boise Farmer’s Market, held every Saturday from 9 A.M. to 1 P.M. This project demonstrates the importance of buying local. It feeds the community and keeps money flowing back to Idaho natives. This process is imperative in order to fuel the communal aspect of Idaho that we all hold dearly to our hearts. 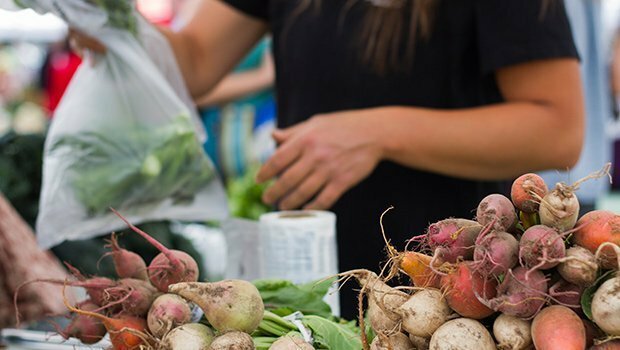 The Farmer’s Market is not just fruits and vegetables—it’s a growing community of Idahoans who grow and raise healthy food, craft local products, and produce goods and services that power our local economy. The Farmer’s Market is a place where you can shake the hand of those who grew your basil with love and dedication. It always seems to taste a bit better when you know where it came from and it is sold directly to you with a smile. Here, Idahoans can find fresh and local meats, wines, cheeses, crafts, and all the fruits, veggies, and herbs you could ever imagine. Purple Sage Farms, based in Middleton, has produced fresh greens and herbs for over 26 years in the valley. They’ve been with the Boise Farmer’s Market since the beginning and have dedicated themselves to creating quality organic food, all the while returning themselves to the farming lifestyles of their childhoods. Purple Sage has helped them spend more quality time with their family while growing healthy produce and raising antibiotic-free, grass-fed sheep, goats, and cattle. Next Generation Organics grows their plants and produce on the Snake River in Owyhee county. They started their farm in 2006 and love being a part of the Boise Farmer’s Market. On a farm where everything is grown with passion, it’s wonderful to be able to sell their products to a community of people who care. Ballard Family Dairy and Cheese have been crafting artisan cheeses since 2004 in Gooding. They began with a small amount of Jersey dairy cows, but have since grown to be revered experts in the art of cheese making. Their family-owned and operated dairy is built off the premise that love and care can create some of the healthiest and most delicious cheeses, and that philosophy has reigned true since the beginning. They produce a variety of cheeses that are sure to tempt and please all palates. They also offer gift baskets that encompass some of their most popular, award-winning cheeses. Indian Creek Winery is new to the Boise Farmer’s Market, and made their first appearance in late May. Started in 1982 by Bill and Mui Stowe in Kuna, Indian Creek offers a diverse array of wines grown from the finest Idaho grapes. Their vineyard is a beautiful, flower-lined butterfly haven with enough splendor to perpetuate the taste of their wines. They have a large, ever-growing selection to choose from and many of them are available for tasting at their winery. Piney Mountain Herbals shows the other side of the market with their herbal extracts, oils, and remedies grown in the mountains of Idaho. Angi and Jamie both work at the Peaceful Belly Farm and have expanded their knowledge of nature and wildlife into an herbal extract company that offers tinctures, oils, syrups, and other incredibly useful products such as their organic apple cider vinegar and fire cider that helps cleanse the body and eliminate toxins. Another unexpected and pleasant part of the market is N2 Stones, started by Cari Comb. Cari handcrafts stones and jewelry from her home in Emmett. Her jewelry is a truly beautiful and one-of-a-kind work of art. The Boise Farmer’s Market embodies the importance of shopping local and the divine sense of community that lives in the hearts of all Idahoans. It is commerce and commonality all in one place. 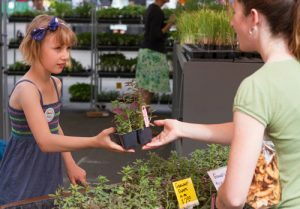 There’s no shortage of locally grown, raised, and crafted organic plants, produce, herbs, crafts, cheeses, tinctures, jewelry, meats, flowers, and much more. With live music, endless samples, and something to appease every taste, there is absolutely no reason not to make the Farmer’s Market your next Saturday morning adventure.